If you’re on a Mac and haven’t expanded your horizons beyond Spotlight, you owe it to yourself to check out Quicksilver, a free, open sourced launchbar app that can prove very handy once you’ve gotten over the learning curve. The app has just been updated with a slew of new features including automatic Plugin updates (see their blog for a full rundown), and has also been optimized for Mac OS X Lion. Quicksilver has an interesting history. The app was originally developed by Blacktree Software, which ceased active development several years ago — but not before open-sourcing their code. Since then it’s seen periodic updates, but they’ve been few and far between, to the point that some longtime fans gave up and looked elsewhere. But in the last six months the app has seen a resurgence of sorts, as updates and blog updates from the team at QSApp have been much more frequent. The site’s tagline? “Quicksilver Lives”. Of course, Quicksilver isn’t the only game in town when it comes to super-powered launch apps — alternatives include Alfred (which is free, with an optional feature-pack available for £12) and LaunchBar, which runs $35 for a new single license. 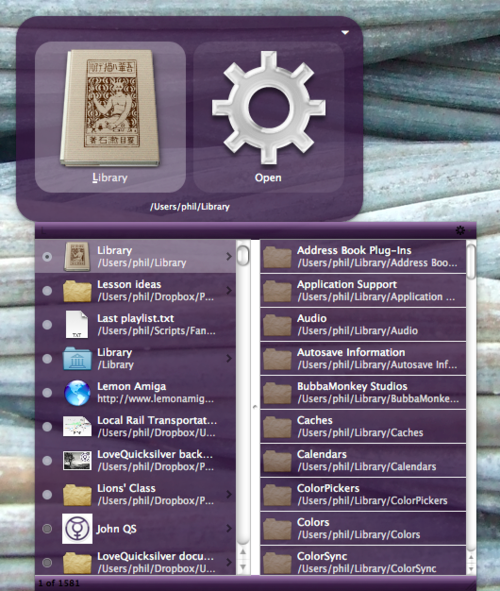 Quicksilver offers its full functionality for free, but it can be more complex to use than some of these alternatives. Ultimately it’ll come down to personal preference — in any case, learning how to effectively use one of these apps can be a major time saver in the long run. Update: Quicksilver lead developer Patrick Robertson reached out to let us know that the LoveQuicksilver site is actually their blog — the app itself is at QSApp.com.